Yet another married DC hero is returning to life as a bachelor on the run. DC's company-wide universe reboot has generated a fair amount of controversy amongst fans, a (underwhelming) protest at Comic-Con, and a lot of criticism when it was revealed that the new comic lines would be doing away with Superman's iconic marriage. Of course, DC is laughing all the way to the bank, since relaunched titles are breaking sales records right and left. 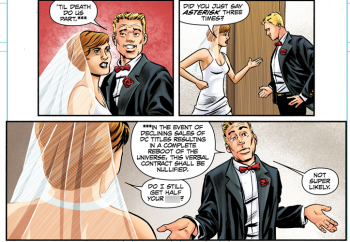 Now, it turns out that DC is retconning another major marriage out of its continuity: The Flash's (Barry Allen) 40+ year marriage is now gone. "If that upsets you, sorry about that," Cunningham writes. "But I make no apologies for opening up a traditional storytelling avenue with our hero's romantic life, something that's been shut closed for a very long time now. This is no indictment of marriage. I'm a married man and wouldn't trade it for anything. But in the realm of fiction, I feel strongly that this change to Barry opens up fresh, new creative directions and exciting new storylines." Personally, I'm a little torn on this. Barry Allen has always been one of my favorite comic characters and I seem to be one of the few people who actually enjoyed his marriage. That said? Married characters are a bit less relatable for younger audiences and it's way more interesting to watch a relationship unfold instead of starting at the "happily ever after" part. However, as MovieBob recently pointed out, continuity changes have a habit of not actually lasting for too long before a new one comes along.